Hi, as a Senior court Reporter, if I have 32 years and I’m approximately 58, do I get a reduction under tier 3 or 4? I never heard that we do. The full benefit age for ERS members in Tiers 2, 3, and 4 is 62. However, benefit reductions do not apply to ERS Tier 2, 3 or 4 members who retire between 55 and 62 with 30 or more years of service credit. We hope this information proves helpful to you. Need to discuss my wife’s Medicare options. She 62+ now. When and what does retirement system do for her. Please. NYSLRS does not administer health insurance programs for its members and retirees. If you or your wife are still employed, your employer’s health benefits administrator will be able to provide information regarding Medicare options. You may also call the Employee Benefits Division of the Governor’s Office of Employee Relations at 518-457-5754 (Albany area), or at 1-800-833-4344. Tier 3 and 4 50% retirement package? Not sure what your question is really asking. Can you provide some more detail? However, NYSLRS doesn’t administer health insurance programs for its members and retirees. If your wife is still employed, her employer’s health benefits administrator will be able to provide information regarding Medicare options. She can also contact the New York State Department of Civil Service at 1-800-833-4344 or 518-457-5754 (Albany area). How do my part-time years factor in to total years of service? About 1/3 of my 25+ years were part time. You can find your latest service credit total on your Member Annual Statement. It includes all unaudited service credit (part-time included) that is currently on file with NYSLRS as of March 31, 2015. Does the same part-time formula above apply to Crossing Guards? The service credit calculation for most school district employees is: number of days worked ÷ 180 days. However, we suggest you contact our customer service representatives to find out information specific to your account. You can email them using our secure email form (http://www.emailNYSLRS.com), and one of our representatives will review your account and respond to your questions. Filling out the secure form allows us to safely contact you about your personal account information. If you are a correction officer employed by New York City, you would need to contact the New York City Employees’ Retirement System (NYCERS). You can find contact information on their website, at http://www.nycers.org/contact/. I will be 61 years old next May 2017, am I entitle to my age (SSI )retirement yet ? If by SSI you mean Supplemental Security Income (SSI), that program is administered by the Social Security Administration (SSA). I need a letter verifying my monthly pension. Unfortunately the NYSLRS social media team cannot access your account information. The fastest way to generate an income verification letter is through Retirement Online. Register and sign in, then click the Generate Income Verification Letter link on the right. You can also email your request using our secure email form. Be sure to provide your daytime phone number and all of your personal verification information when you submit your email. In most cases, we’ll mail your letter in five to seven business days. Or, you can fax your request to 518-473-5590. Include your retirement or registration number, current address, signature and phone number in case we have questions. Let us know if you would like the verification letter mailed to you, or, if you would like us to fax it, please provide your fax number. The specific benefits of NYSLRS retirement plans—and who is eligible for each plan—are determined by New York State Retirement and Social Security Law (RSSL). You can find details about our plans on our Publications page. For example, our VO1526 publication covers ERS Tier 3, 5 and 6 members who are full-time, uniformed employees of the New York State Department of Corrections and Community Supervision and security hospital treatment assistants for the Office of Mental Health who elected the plan. Or, our VO1517 publication covers Tier 2, 3, 5 and 6 police officers and firefighters who are in the plans provided by Sections 384, 384-d and 384-e of RSSL. Check with your employer if you’re not sure what plan you’re in. If you are over the retirement age at Pier 6 and have less than 10 years of service, Does that affect in any way when you can retire? Yes, it does. Tier 6 members can’t retire until they have at least 10 years of service. Hi – I am a New York State school nurse who is maybe considering retiring from my job next year @ 53 years of age. Will I need to put in my paperwork for the state (and not just my school district) as well – and how long before I plan to retire? Where do you find all that paperwork? Most NYSLRS members must be at least 55 to retire and receive a pension benefit. Benefits such as death benefits and health insurance may be affected if you leave public employment before you are eligible to collect your NYSLRS pension. If you are considering leaving public employment before age 55, we suggest you speak to one of our customer service representatives (call 1-866-805-0990) about pension implications, and to your employer about any possible health benefit implications, before you leave employment. You would submit your retirement application to NYSLRS at least 15, but no more than 90 days before your intended retirement date. Your Retirement Benefits book (see link below) is a good place to start reading about the forms you will need and the retirement process. How long after your 62nd birthday can you stay in order to get maximum benefit? For the account-specific information you need, please email our customer service representatives using our secure email form. One of our representatives will review your account and respond to your questions. Filling out the secure form allows us to safely contact you about your personal account information. Hi I am 57 and have 28 years of service. If I retire what will my penalty be? I am tier 4. I am 65 years old and retired since 2009 and receive my pension and social security can I work for New York State, or anyone else and keep my monetary benefits in full? There is generally no restriction on your earnings beginning in the calendar year you turn 65 (unless you are receiving a disability retirement benefit or you are in public office), even if you return to work for New York State. For more information, check out our Life Changes: What If I Work After Retirement? publication. I am a little confused. I am tier 4, 56 with 31 + years if service. I keep reading that because I have the age and years of service I can retire without penalty, but than I read that I have to be 62 to receive 100%. You are correct; benefit reductions don’t apply to ERS Tier 2, 3 or 4 members who have 30 or more years of service credit. (See the Service Credit Exceptions paragraph in the blog post). Can you explain for Tier 2 members if you were to retire after age 65? Can you explain what happens to Tier 2 members who continue to work after age 65? Do we get moved to another Tier? No, your tier doesn’t change. Your Tier is based on the date you first joined NYSLRS. Your retirement benefit after age 65 depends on your retirement plan and the date you intend to retire. For the account-specific information you need, please email our customer service representatives using our secure email form and let them know what date of retirement you are considering. One of our representatives will review your account and respond to your questions. Filling out the secure form allows us to safely contact you about your personal account information. When you join NYSLRS, you are assigned to a tier based on your date of membership. Unless you have a former membership in one of New York State’s public retirement systems to reinstate, your tier will not change over the course of your membership. I’m tier 4, that will not have 30 full years until 12/1/19, I am 62 now. Had numerous part time years. Will leaving 6 months earlier in June of next year reduce my benefit? No. Your retirement benefit will not be reduced, because you’ve already reached Tier 4’s full retirement age of 62. However, because your pension is partially based on your total service credit, the longer you work, the higher your pension would be. If you’d like a better idea of how an earlier retirement might affect your benefit, try our online retirement benefit calculator. It will let you estimate your benefit with different retirement dates, final average salaries and service credit totals. By changing each variable, you can see the impact it may have on your benefit. Im a tier 3 , and retired in Dec. 2007 @62 and 30 years. How do I figure out my death benefits. I was told my contributions are also figured in. I contributed until it was changed by legislation. There are a few possible death benefits that may be available to NYSLRS retirees. Unfortunately, the NYSLRS social media team does not have access to your personal account information. I retired in 2009 with 8 yrs and 4 mos. as a member of ERS, and 26 yrs and 9 mos as a member of PFRS, for a total of 35 yrs, 1 month. I was told if I retired from the ERS i would be penalized because I was less than 62. I chose to retire under the PFRS and received 61.3%. If there was no penalty for tier two members under ERS with over 30 years of service It appears my pension should be higher under the ERS. Unfortunately, the NYSLRS social media team doesn’t have access to your retirement account information. Transfer options and retirement benefits can vary depending on the specific retirement plan under which you’re covered. Service requirements for retirement can vary by employer and by retirement plan. Generally, with fewer than 25 years of creditable service, you may retire as early as age 55, however there would be a reduction for retiring before age 62. At age 56, correction officers who are Tier 3 members would see a benefit reduction of 26.67 percent. However, for questions about your particular situation, we recommend emailing our customer service representatives using our secure email form. One of our representatives will review your account and respond to your questions. Filling out the secure form allows us to safely contact you about your personal account information. For more information about benefit reductions, see the Service Retirement Benefit section of your plan booklet (VO1526). I am a police officer in Tier 6. I was hired when I was 21 and am in a plan that allows for a 20 year retirement. Just curious as to what my percentage will be when I am eligible to retire at age 41. Thank You! If you are in a 20-year plan, your percentage at 20 years would generally be 50 percent of your final average salary with no reduction for early retirement. the total of twenty years part time and over two years ifnpart time – tier 4, now is equivalent to 15+ years full time. How does that apply to my entitlement for benefits when I retire in 4 or 5 years? Under most Tier 4 retirement plans, if you retire with less than 20 years of service credit, you would receive 1.66 percent of your final average salary (FAS) for each year of full-time service. With 20 or more years of service credit, the benefit would equal 2 percent of your FAS for each year of full-time service. However, most members who retire before age 62, with less than 30 years of service credit, will have a permanent benefit reduction for early retirement. 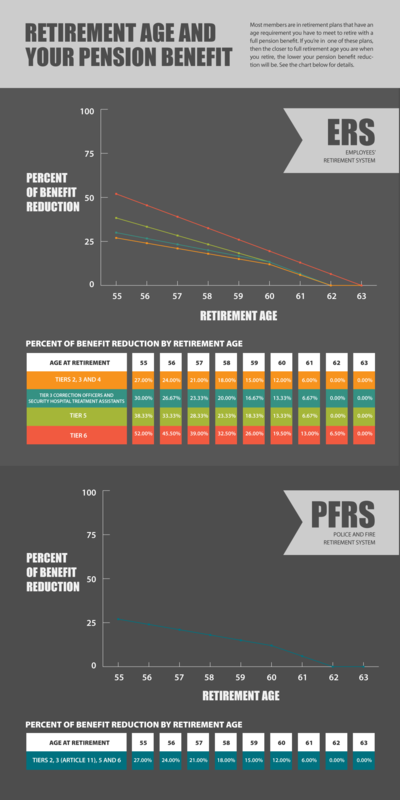 The specific amount of the reduction varies by age. For information about your particular situation, you may want to try our Benefit Projector Calculator. You can estimate your benefit with different retirement dates, final average salaries and service credit totals. By changing each variable, you can see the impact it may have on your benefit. Hello i am 52 but have 30+ years of state service and am in teir 4.So i have the required years of service but not age.Is there a penalty if i choose to retire soon. Most ERS Tier 4 members who have 30 or more years of service credit can retire as early as age 55 with no benefit reduction. You could choose to go off payroll before age 55 and wait until 55 to collect, but you may lose certain benefits by not retiring directly from payroll. If you are considering retiring before age 55, we highly recommend that you email our customer service representatives with any questions you have. You can use our secure email form. One of them will review your account and respond to your questions. Filling out the secure form allows us to safely contact you about your personal account information. I’m a FERS Disability retiree. Do I qualify for the 55 yr retirement system? Disability pensions weren’t tax now it seems a different show altogether. If you are looking for information about the Federal Employees Retirement System, you need to contact the U.S. Office of Personnel Management. You can find contact information on their website, at http://www.opm.gov/retirement-services/contact-retirement/.